Switchblade focuses on the memory of the body as seen through the accumulation of markings, scars, and memories arising from accidents, dreams, probes, operations, and other invasions of the body. The installation consists of one projected and one monitored image placed on the floor approximately 20 feet in front of the projected image. 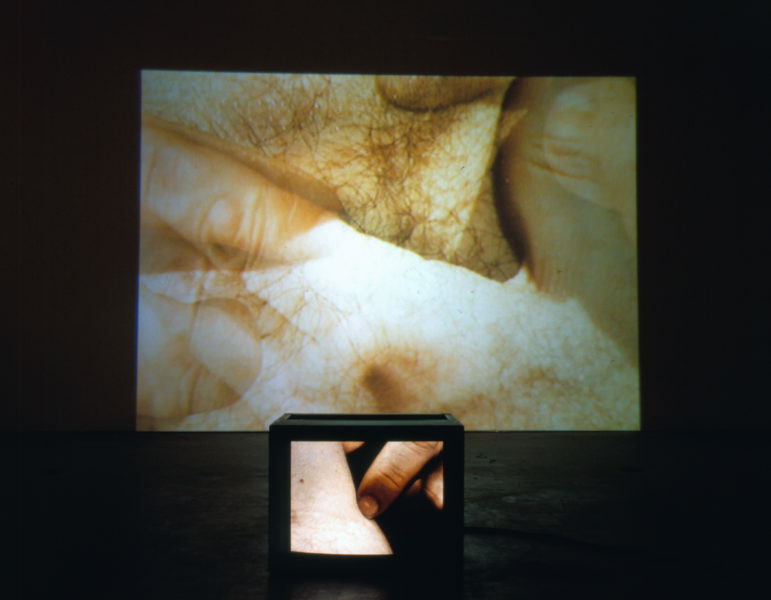 The images originate from real-time multiple views of the body which have been interwoven via a precision process of editing/switching into a single stream of alternating images of two frames each. If two images are “woven” together they will appear to be moving at 1/2 normal speed, since they are in effect sharing time. If three images are woven together, they will slow to 1/3 speed and so on. Seeing the whole is not unlike looking through a microscope at different focal points that bring out different convergences. Together the images constantly fold in on themselves turning the seen and the unseen into another kind of image space. At certain points one of the images is selected out of the sequence and is switched to the frontal monitor at each turn of its weave. Thus if there are five images (ten frames) on the projection at the moment the monitor is incorporated, four different images (eight frames) are seen on the projection accompanied by one image (two frames) on the monitor. As the weave cycle continues, additional frames are added to the monitored image allowing it to be seen longer and longer. Coinciding with the incorporation of the monitored image are spoken texts that detail the various incidences the body has been going through. Simultaneous with the appearance of the image on the monitor (2-10 frames or 1/15 – 1/3 of a second, the text is interrupted with silence and picks up where it left off when the image returns to the projector. This creates a kind of staccato effect in which the voice on/off pattern changes corresponding to how long the image is on the monitor (silence) and how many scenes/frames are being cycled through on the projector (sound). The way the voice and images are embedded in the structure produces an undeniable physicality that tugs the memory in a highly visceral way. 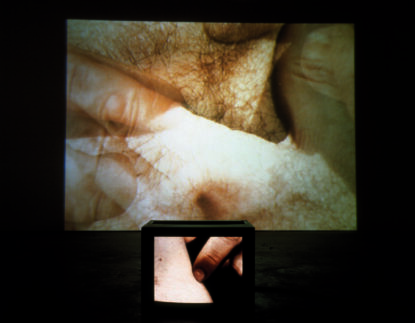 An example of this work was exhibited for the first time as a work-in-progress in a solo exhibition at The Kitchen, New York, New York, December 4 – 19, 1998. It was first exhibited as a completed work at the Aarhus Kunstmuseum, Aarhus, Denmark, January 17 – April 5, 1999. Solo exhibition. Sprengel Museum, Hannover, Germany, November 24, 2000 – March 4, 2001. “Bilanz in zwei Akten, Collection Niedersächsischen Sparkassenstiftung,” Kunstverein Hannover, Germany, June 11 – July 10, 2005. “SCHMERZ (Pain),” Hamburger Bahnhof – Museum für Gegenwart, Berlin, Germany, April 5 – August 5, 2007. Kold, Anders, ed. Gary Hill. Aarhus: Aarhus Kunstmuseum, 1999, pp. 5, 75 – 85, 114. Quasha, George and Charles Stein. La performance elle-même in Gary Hill: Around & About: A Performative View. Paris: Éditions du Regard, 2001, p. 10. Gary Hill: Selected Works and catalogue raisonné. Wolfsburg: Kunstmuseum Wolfsburg, 2002, pp. 223 – 225. Bilanz in zwei Akten. Hannover: Niedersachsische Sparkassenstiftung Hannover, 2005, pp. 10, 11, 62 – 63, 197, 263. Schmerz. Berlin: DuMont and Nationalgalerie im Hamburger Bahnhof, 2007, p. 19, 302. Quasha, George and Charles Stein. An Art of Limina: Gary Hill’s Works and Writings. Barcelona: Ediciones Polígrafa, 2009, pp. 37, 594. He was diagnosed with an enlarged misshapen heart. The history of a heart murmur was also under scrutiny. They decided to do some in depth studies that amounted to cathitization studies of the heart and points leading to and from. He was sedated with a shot but the nature of the test demanded that he be awake. He watched the entire procedure on a television. A small 1/4 inch incision was made in the crook of the arm. Large but delicate hands using fine instruments carefully pulled a vein out and inserted a tiny clear tube. He felt it inching up the arm around and down the shoulder all the while seeing it on the monitor. It was strange having a foreign body poking around like some kind of insect looking for a place to nestle. He wasn’t exactly sure of the locations being looked for but they had difficulty finding them. It was something to do with the way the blood was moving through the valves between the aorta and veins and the two ventricles. A number of moles observed as having possible cancerous properties had been removed--they were burned off with electricity. It’s the smell rather than the pain that’s memorable. Once nitrogen was used. Its extreme coldness annihilated the questionable mark leaving an odd spot of discoloration on his forehead. Dangling unpredictably from its chains an empty swing struck him just above the temple. His father took him to the hospital where they were greeted with chaos and confusion—police, reporters and doctors were moving quickly in all directions. He was placed on a little table in a small operating room separated from the events. He could see into the next room; someone had been shot a number of times and was wrapped extensively with bandages that were saturated with blood. His attention quickly turned to a monstrous hypodermic needle being placed at the head of his table. Soon it would sink into his head and be followed by stitches with that numbed sensation of tugging at the skin. He had a propensity for tonsillitis. In the 50’s radiation was often used for diagnoses. Some twenty years later he received a letter warning of the possibility that he could have had an overdose of radiation and should have his thyroid glands checked periodically for cancer. One of his testicles has an inordinate long vein that looks almost like a tiny set of intestines that has collected in the scrotum. At times painful the anomaly is described as a vericocele which is the dilation, elongation and tortuosity of veins within the scrotum. He broke his ankle in something of a freak accident. At first it seemed just twisted and the pain would eventually dissipate. There was a cracking sound as he was flipping over which must have been the bone. The ankle swelled to the size of a grapefruit. The broken pieces had slipped a fraction of an inch. There would be surgery. It was the first time he’d been to a hospital in a long time. Once again expedience was everywhere along with a continual sterilization process that is always visible: Hands being scrubbed, gloves donned, even shoes could be seen wrapped in plastic. The difference was the constant explanation of what was happening; of what was going to happen to him at every moment. This time it was an IV through which the first drops of the sedatives ran. In a short time they wheeled him to another room for the operation. One more explanation and then came the anesthesia. No memory; no feeling; no time. What I will call the instant/eternity oscillator erased a segment from his life and the pieces before and after were healed to form a seamless unit of time. He had a cast on his leg and cajoled as much Demerol as He could. The drugs were very pleasurable while doing their job of relieving pain. He hadn’t urinated since the operation and they were hinting at the possibility of a catheter to alleviate his bladder. No, he thought, this was out of the question. He eventually managed to empty himself and was released. As he was already near depression, having to traverse a three-story flat with crutches eventually took its toll. He was exhausted. Breaking down for no reason he finally just couldn’t get up off the floor. He admitted himself to the university mental hospital. Directly over his sternum there is a pomegranate red mole known more uncommonly as a henangioma. His mother has one almost in the exact same spot. Jumping on the bed trying to touch the ceiling he lost control and went flying off to the side, hitting a rocking chair. His cheekbone landed squarely on a sharp knob, just missing his eye. The whole side of the face fell open like some kind of peeled fruit. Blood was gushing out. He dreamt of waking with two chevron shaped scars just above his knees. There was a feeling of something having been removed or implanted. He was sitting on a miniature labyrinth-like structure made of cotton and framed in beautiful wood. A Japanese man was sitting across the way looking down with the same bewildered expression. His chest was hairless with a thin layer of perspiration. A tiny gold Pegasus and chain swayed like a metronome touching his sternum repeatedly.